Sometimes it seems hard to write a blog post that contains 1,500+ words. There are various reasons why writers can’t come up with even a short form piece of content (like 500 words). I don’t want to mislead you, but early in my writing career, I had a few obstacles that always distracted me from writing. What I had trouble with were things like an absence ideas, lack of writing skills, doubts if the audience would accept my topic, procrastination, and laziness. When I found out that short form content doesn’t make any waves, I was desperate. I had nothing else to do but reconstruct my brain to write long-form content. Frankly speaking, I had no idea why “big” content rocks. 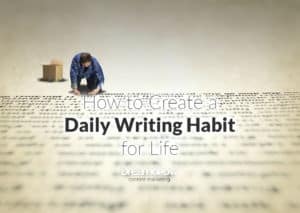 Once I noticed that writing long articles is pretty interesting and (what’s most important) profitable in terms of results, I decided to focus only on that. In this guide, I’m going to introduce you to why long-form content deserves to be on the of your to-do list, how to create it, and tricks you would love to use. SIDENOTE: if you are curious about how many keywords you can rank for with one page, you should check out this guide. 1. 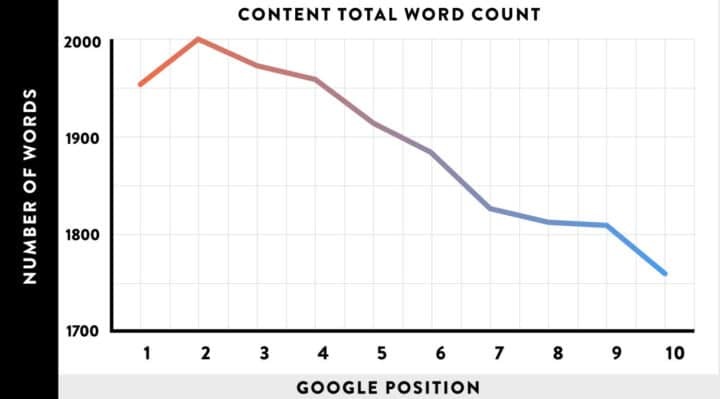 Why Does Long-Form Content Work? If someone persuades you to do something, you obviously need real-world evidence as to why you should do so. And it is OK. That’s why the first thing I want to do is to give you reasons for writing long-form content. Again, long-form content is a leader. My first question, “Is long-form content easier to convert than short content?” I didn’t know until I found that long-form content allows you to upgrade it. It is hard to add some additional elements to short articles that contain a limited amount of information. Forget about the opportunity to download a PDF of a post or a set of videos on the same topic. On the other hand, long articles let you do so. You can download a free checklist during the reading this article. Cool and convenient, right? You can do the same thing when writing your own articles. It is easy to do, and it is quite effective in terms of expanding your content. 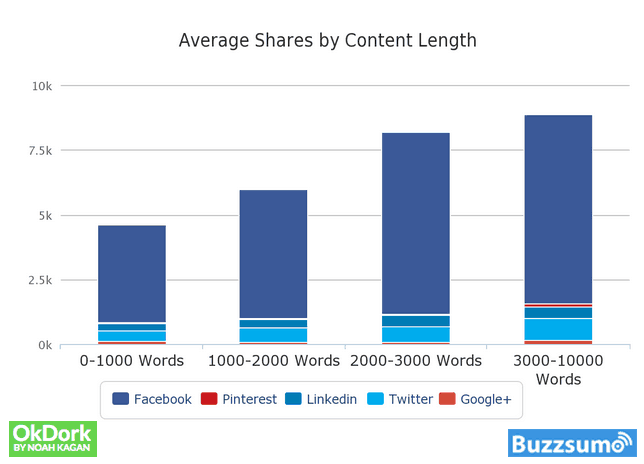 Numbers speak louder than words:) This is another reason for you to create long-form content. It goes without saying that your content must be strictly relevant to the topic you want to cover. You know that Google considers topic relevancy as one of the important ranking factors. If you want your content to be always up-to-date, you should never neglect it. However, what does that mean in terms of long-form content? It simply means you should pay attention to what inquiry your piece of content might fit. Here are a few examples. 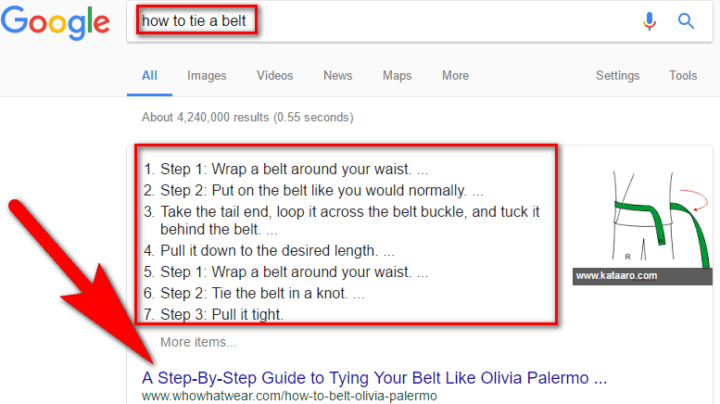 Here you get step-by-step instructions on how to tie a belt and you don’t have to read a huge piece of content to understand these steps. But, as you can see, there is an article below the “tie belt instruction”. Once you click it, you will get the same steps mixed with images of the process. It has nothing in common with long-form content. In contrast to two previous query examples, the next one definitely resonates with an epic piece of content. It is obvious that a particular query demands to be covered in more detail and the only solution here is to create long-form content. 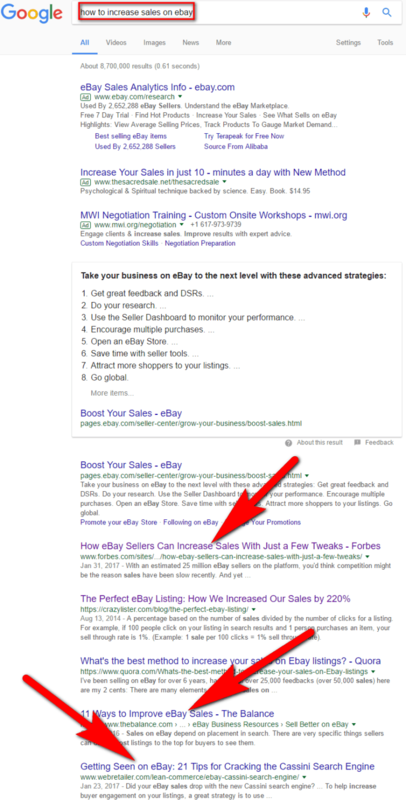 My last example shows exactly what I am talking about – “how to increase sales on eBay” is a serious topic. Thus,there is no alternative but to write a detailed guide which might be around 3,000 + words. And here the question of relevancy is the metric you should be focusing on while writing long-form content. 2. How to Create Long-Form Content? Nobody says that writing long-form content is a simple task but nobody says that it is unreal to do it as well. Yes, it takes lots of time, efforts, and attention. Yes, it is boring, exhausting, and monotonous. On the other end of the spectrum, writing a long-form article is very interesting and insightful. You do some research or a case study and present it to the readers sharing useful knowledge. You will show yourself as a skillful marketer (or an expert in the niche you are) and, of course, as a talented writer. There is no sense in writing something if you don’t have a vivid topic on your mind. I encourage you to focus on the things that are in-demand for today. Sure, it must be relevant to the niche you’re working in. Sure, it must be useful. But, please, don’t waste your time on the things that won’t be interesting for your audience (or that are outdated). Here’s how you can come up with blogging ideas. That’s why I would like to suggest a couple of ways on how to find really insightful topics to highlight. As the results are given, you can see what people love to read currently. Here are some examples on how you could paraphrase these topics creating something new. Popular blogs. 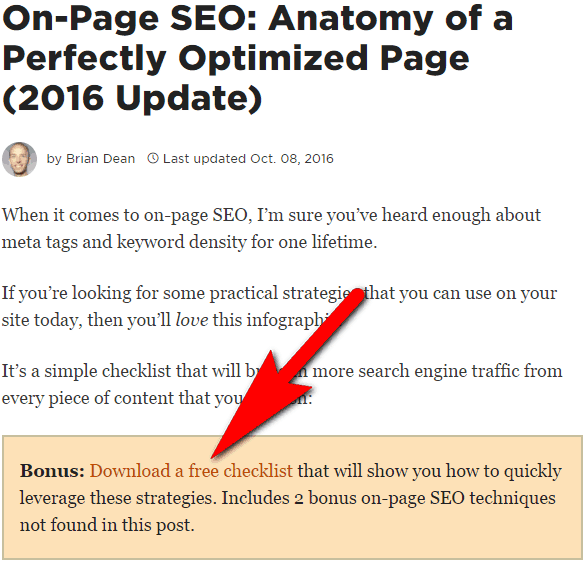 Visiting various popular blogs in your niche is a great way to pick up a bunch of new insights. Just check out those topics that are in trend for the last year and keep an eye on those that have more shares and comments. I can’t imagine writing a post without a well-prepared outline. It is a kind of disaster when my thoughts are everywhere and I don’t have a consistent structure of what to write and so on. That’s why I want to show you how to create an outline for any article and make the process of writing much easier (and even delightful). And you know, in order to better illustrate the actual outline, I will show you how I do it myself, taking the topic of this very article as the example. Make sure you know what type of content you want to create. Basically, there are a couple of types of content, like “How-to” articles, “Lists”, “Review”, and “Guides”. Each type has its own structure and criteria (you should follow). I won’t describe these types of content one by one (you can find lots of information about them on the web) but make your choice wisely. Identify the “head” sections of the post. When I came up with the topic, the first thing I did was identify the core sections of my post. I recommend that you start with general questions and ideas like I do. For instance, this topic is about long-form content. So my audience would like to know “Why long-form content does really work?”, “How to create it?”, “Some actionable tips on this matter”. Voila, three main sections (don’t forget about introduction and conclusion) and you’re ready to go. Create sub-sections. When you see that your main sections are ready, it is time to take care of sub-sections. It means you should consider each main section in detail. For example, if one of my “head” sections is “Why long-form content does really work?”, it means that I need to expand this question. In this very case, I had to provide the reader with clear reasons as to why long-form content works. Additions to sub-sections. Don’t neglect to make your sub-sections full of more smaller sections. It will allow you to better consider a concrete aspect of the article. It should look like this “Ways how to create long-form content” – “Come up with a fresh idea” – “Skyscraper technique”. As you can see, the main section is divided into sub-sections and an addition to it. Believe or not, it is easy to create a perfect outline and, afterwards, don’t bother with writing a post. There is nothing worse than if you wrote a big piece of content but got nothing in return? Yeah, if all the writer’s efforts were in vain. One of the main problems lots of long-form content creators face is using wrong keywords in the posts. 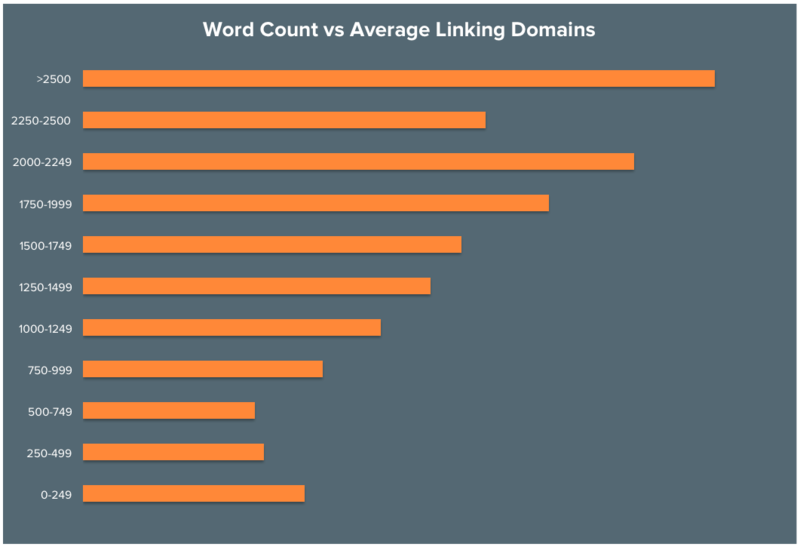 As far as you know, long-tail keywords are not a good option for long articles. They have little search volume (while you try to impress lots of users with your “beast”). Competition strength. If you want to hit the jackpot, you will have to “play” with serious competitors. 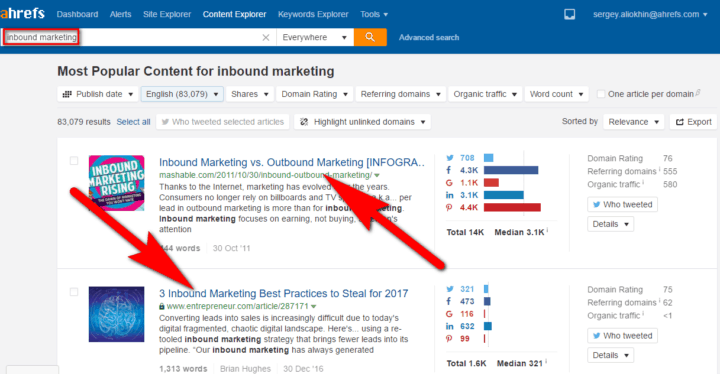 It isn’t difficult to guess that the higher quality the competition content is, the harder it’s going to be to rank for the keywords this content sticks to. Thus, I recommend that you always analyze the TOP 10 results for a given keyword. Yes, the first group of competitors’ content will definitely have strong DR (Domain Rating), lots of backlinks, and a high URL rating. What does that mean for you? As I’ve already told you, it will be hard to rank for the keywords that are used by your competitors. Nevertheless, you can do an in-depth observation of competitors’ material and create even better. And only long-form content can help you win this battle. So, now you will be able to target only those keywords that really will bring you benefits. Can you imagine reading a huge as hell article that is written in a more technical manner? I, personally, can’t. Furthermore, to me, this kind of post seems too boring, too heavy in reading, too hard to understand…there are a bunch of negative factors. And a question appears in my mind “How can I make long-form content more engaging?” I would like to answer this questions listing a couple of tricks to make your material more informal. A primary goal of content is the information it brings but there is another aspect that plays a crucial role as well. I am talking about emotions that content brings out. Yeah, if the material doesn’t grab you, it will be wasted on you. That’s why it is strictly important to add some humor to it. Try to make your reader smile (but don’t overdo it). Moreover, if you have a one-sided conversation with your reader, it will prompt a positive reaction in return. You ask him or her various rhetorical questions, share your thoughts, and doubts. It makes reading the article more vivid. Taking into consideration the fact that reading tremendous content takes your time and efforts (yeah, sometimes it is hard to digest what you read), it is inexcusable to forget about following a proper text structure. The body of the post should have short paragraphs and plenty of headings/subsections. Don’t write too long sentences; don’t write more than 5 sentences per paragraph; don’t use super-hard sentence structure; don’t use mind-bending terminology. Remember that the user might be afraid of articles that consist of only a few mega-large paragraphs. I don’t know about you but I don’t like reading articles with this kind of text structure. 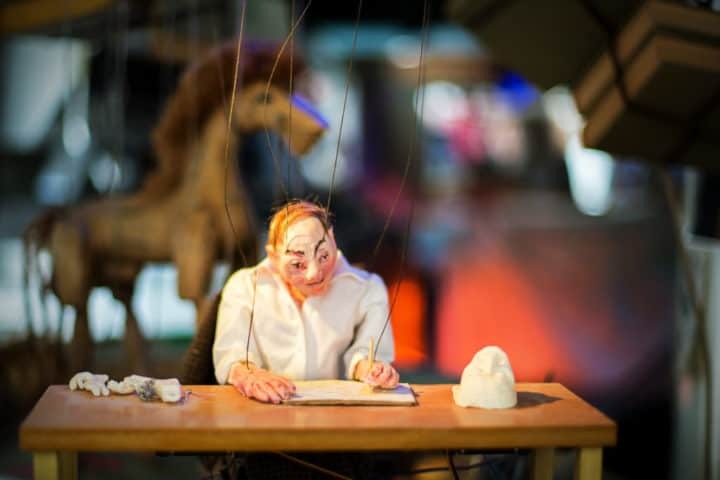 Paragraphs, sentences, letters, symbols, and nothing more – would you like to read such stuff? I bet you wouldn’t even skim through it. It is nonsense to write a long-form piece of content without any images, infographics, and other visual examples. So, I encourage you to add more visual elements in your written work! Here’s a ton of sources where to get free images. Navigation throughout the article is necessary, especially for those people who don’t have much time for reading. It allows users to get to the exact part of the article that highlights a particular topic (subtopic). Thus, make sure the navigation is present in your content. Linking to other resources shows that you did an in-depth research of the topic. You offer users the ability to get familiar with some aspects of your theme from various perspectives. Furthermore, linking to your competitors’ material (if it’s worth it) represents a transparency and solidarity of you as a businessman. Actions speak louder than words. This conventional wisdom should be applied to your content. Nobody likes to read “empty words”; everyone wants facts and examples. If you have something to prove or dispel, please be ready to add real pieces of evidence like screenshots, various diagrams, infographics, video/audio materials. Start writing your long article now! I want to sum up saying that creating long-form content is a good opportunity for you to show yourself as a skillful writer, marketer, and businessman. Because only a massive research can bring real value to your target audience and, as a result, you will get benefits in return. Despite all this, you should try. Accept this challenge and you will see that one day you will be rewarded for your efforts. 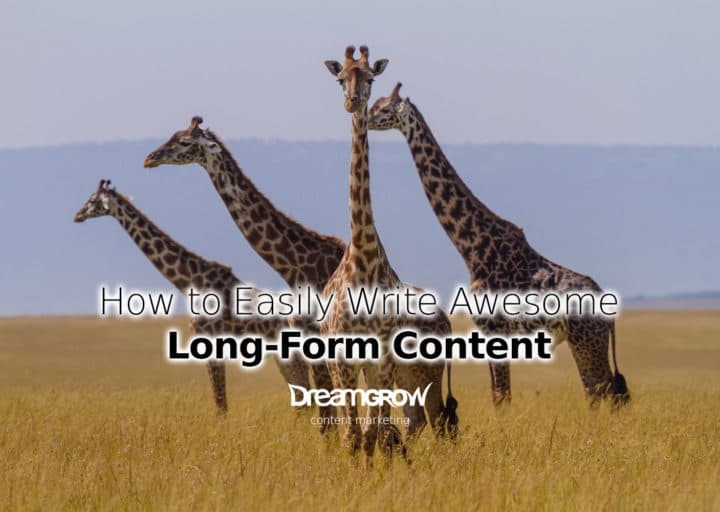 I hope this guide has given you some ideas how to become better at writing long-form content. Author’s bio: Sergey Aliokhin is an Outreach manager at Ahrefs. He spends most of the time discovering and learning SEO and Internet Marketing. His primary goal is to study and practice new aspects of an outreach strategy. In his spare time, he likes to spend his time with family, visit specialized sports club, study martial arts. If he has nothing to do at all, he prefers reading books on science-fiction and playing the bass guitar.